Enjoy a close-up view onto a cliff-side nesting colony, with binoculars and telescopes provided. You'll be able to watch guillemots, razorbills and puffins all raising their young, while live television pictures give you an even closer view of the nests! Rare choughs can also be seen on the reserve. The RSPB reserve is open year round. Ellins Tower, the RSPB visitor centre, is open from Easter to September. Access to Ellins Tower is via a steep flight of stairs. now the RSPB viewing tower, for the birds nesting on the cliffs in spring. 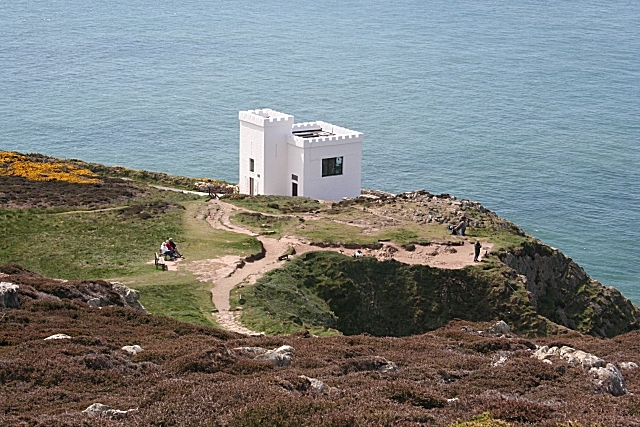 The South Stack reserve is very popular with visitors and visitor activity is concentrated around Ellins Tower (a castellated folly), where the paths are maintained to a higher standard than elsewhere on the reserve. The heathland areas and their network of paths are open to the public (on foot) at all times. These paths cross a mix of coastal and heathland terrain and some pass close to cliff edges. There are no specific RSPB trails, but the route of the Ynys Gybi circular walk and the Anglesey Coastal Path are waymarked along with the routes of other public footpaths. The nature of the terrain makes many of the paths steep and rocky, making access difficult for anyone with impaired mobility. A well-surfaced, high-quality 2m wide track with benches runs from the RSPB car park (complete with three disabled parking bays) into the heathland and onto a viewpoint in front of Ellins Tower. The permissive path through the farmland connects the two areas of heathland. This path is open to the public (on foot) at all times (except 10 December each year). Grazing animals are present, so please take care and keep dogs under close control. 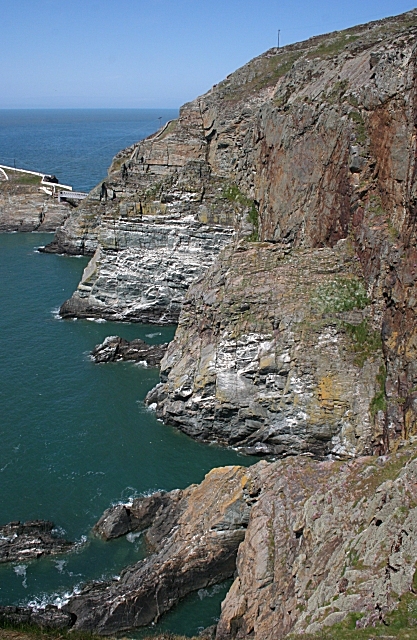 The image on the left is of the cliffs around South Stack where the seabird colonies of Guillemots, Razorbills and Kittiwakes nest during the spring. Puffins nest in burrows in the earth on top of the rocks. 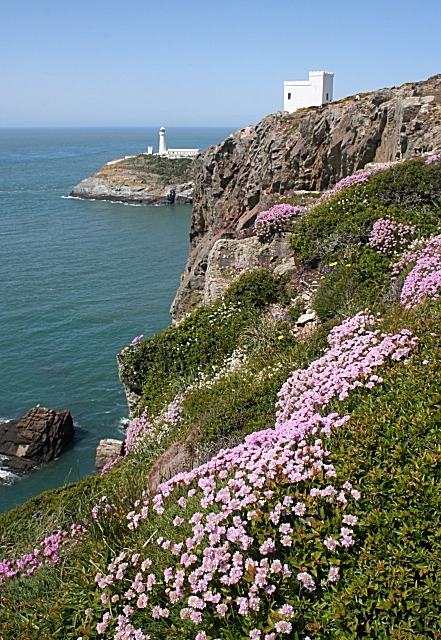 Access to the Isle of Anglesey Council's South Stack Island and the South Stack Lighthouse visitor attraction is via approximately 400 steps of variable rise and tread width down the cliff (not part of the RSPB reserve). and the cliffs covered in Thrift or Sea Pink, taken in May 2010. Getting there: From North Wales follow the A55 to Holyhead, then continue on the A5 into Victoria Road. Take left spur into Victoria Terrace and on into South Stack Road follow this until you end up at the car park of the visitor centre. Access: Good access from car park, with 3 bays for disabled visitors. Path to Ellins Tower and one of the view points. Rest is via footpaths. Steep steps into Ellins Tower. Charges: Free to RSPB reserve. There are charges to South Stack Island and the Lighthouse. Notes: There is a tea room, South Stack Kitchen Cafe which is now owned and run by the RSPB. Open from 10am-5pm daily with hot food served between 11.30am-3pm.